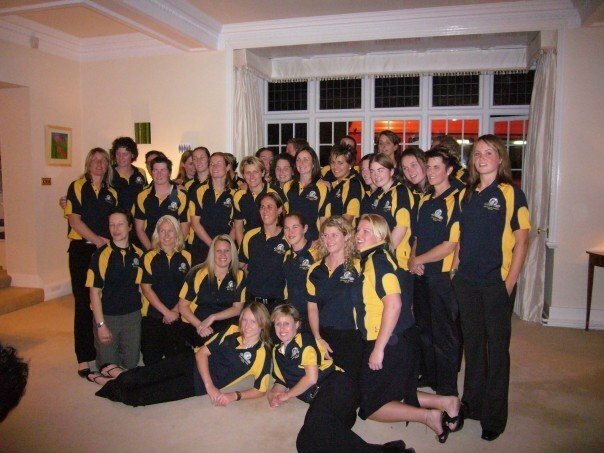 Another female player Cora Staunton played in the International Rules Series in 2006 for Ireland and said how “it was great to play in it and lovely to represent your country. Great to play in it and play with girls from other counties”. So the female players from both Ireland and Australia enjoyed playing International Rules, but it seems the series was discontinued due to the relations turning a bit sour. The men’s series was suspended after a number of violent incidents that were particularly poorly received in Ireland and this majorly affected the women’s series from discontinuing the following year. The women’s series never resumed and Julia believes “the main reason was because we absolutely got flogged by the Irish, they (the Irish) we were not prepared to negotiate on the rule of tackling, so it made it very hard for us to have a skill that that made us equal in the game. We even suggested using a AFL football instead of a round ball, but not even that could be compromised for tackling. We were basically playing Gaelic Football against players that had played Gaelic Football since they were toddlers, it wasn’t an even playing field. 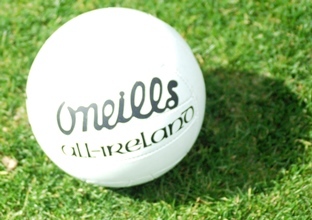 The only noticeable difference between Gaelic Football were the goal posts and stop start after a mark”. Also Cora Staunton feels the women’s series was discontinued due to the fact “maybe the overall series were very one sided the Irish were a lot stronger. Also the running of the series every year and the (Gaelic) all-star trips started around 2004 so the emphasis was put on them." But now given the strength and growing professionalism of the women’s game in Australia and the desire for the game to have a competitive pathway for young girls to be part of that, is it time to re-start the series. Provide an international carrot at the top of the elite women’s footy pathway, an Australian jumper. Josh Vanderloo who is the Head of Competitions and Player Movement in the AFL says a Women’s International Rules Series could be resurrected, as “I’d expect that we will look at options for as early as the 2018 season”. Vanderloo also believes that if the Women’s International Rules was to be revived that it “should be a double header” to the Men’s International Rules. Likewise, Boyle feels the same way as Vanderloo, as she said “I always believe that it should be a curtain raiser, the AFL should treat both the men’s and women’s teams the same”. There was no tackling in the Women’s International Rules in 2006, but Vanderloo says in the future a resurrected Women’s International Rules “would be played under the same rules as the Men’s unless there was a compelling reason to change anything”. 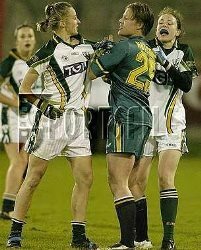 The Australian team in 2006 were well beaten by the Irish team but with the new levels of professionalism in AFLW the Australians would be more competitive in a Women’s International Rules if it was resurrected and Vanderloo says “as athletes, the AFLW players would be better prepared than ever before”. He also believes the “utility type players such as Chelsea Randall, Ebony Antonio, Karen Paxman and of course Erin Phillips would be great (and plenty more)” in a Women’s International Rules revival. Boyle who played in the last International Rules believes the Women’s International Rules should most definitely be resurrected. She expressed how “she was very disappointed it didn’t continue after that year. There is so much talent in Ireland, and they would still match the current AFLW players”. Also the new levels of professionalism in AFLW has according to Boyle provided girls with “more opportunities now to concentrate on their training and skills without full time work commitments getting in the way, workplaces are also more flexible with girls who have sporting commitments”. "There is also more funding and sports medicine technology, and most importantly diet. For example the food situation when we got to Ireland was a debacle, we had nowhere to prepare our own meals, and the food we were given wasn’t very conducive to an athlete in training. Healthy food at the time was really had to find near where we were staying in Dublin. This would be different now. Back in 2006, we basically had to work to fund the trip, we personally spend between $2000-3000 for the experience to go, we were give a little subsidy, but it wasn’t a free trip by all means." The Australian women are not the only ones who want to be involved in the Women’s International Rules, as the Irish are keen too. Laura Corrigan Duryea who is Irish and plays for the Melbourne Football Club in the AFLW expresses how keen she as a player is if the Women’s International Rules was to be resurrected, as she said “of course I would a combination of my favourite two games in the world”. Staunton said “yes most definitely and I think most Ladies footballers would love the chance to represent there country like the men do”. Boyle says how she “would definitely support it, and the Irish would definitely be keen”. She goes onto say “I will be interested to see the progress of Cora Staunton who recently got drafted for GWS, she was the most dominant player when we played Ireland in 2006, and I would say she is the best footballer I have ever seen or played against. She is a legend in Ireland. So given the fact she has now moved to Australia to give it a go (AFLW), I think off the back of that, Ireland, will be very interested in getting the series back up again if she performs well this season”. So Duryea, Staunton, Boyle and other Irish players express how eager they are all to play in a resurrected Women’s International Rules Series. AFLW players such as Brisbane Lions Kate McCarthy have voiced their desire on social media for a series to resume too. Staunton also believes the Ladies Gaelic Football Association and the AFLW both “would benefit from it as it would give more media attention to our game which is always a plus”. Furthermore Duryea says, “the AFLW would definitely benefit with the opportunity to spot future talent. Obviously if the Irish girls get a taste for the game or are recruited this would require to uproot and move to Australia which would be a massive loss for their respective clubs and counties. On the other hand it’s an opportunity for these girls to be a semi professional athlete in a sport so similar to the one they have grown up playing”. The momentum if certainly building for the series to be resurrected, players and officials looking at the resumption in a positive light and believing it would be a win for both codes. We can reasonably hope that we could see the Australian women's team go to take on Ireland in 2018 and play as the curtain raiser to the men's matches if the AFL and Ladies Gaelic Football Association can agree to terms. Thanks to Julia Boyle for the images used with this article. 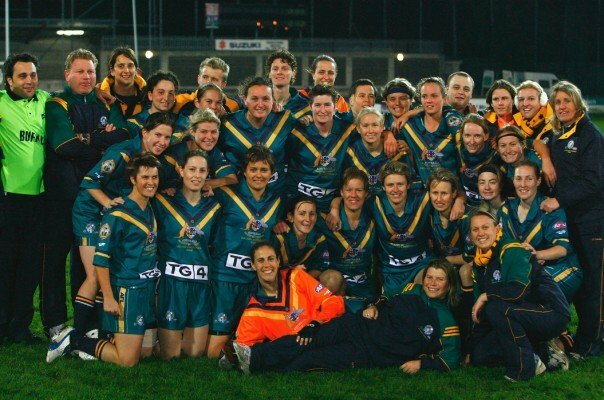 Also read about a women's International Rules series between Sydney Women's AFL and the New South Wales (Australia) Women's GAA played in Australia in 2004 here.